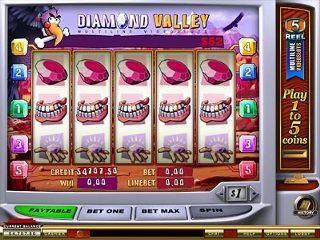 Diamond Valley now has recently upgraded its graphics and now offer a new bonus round and big jackpots. 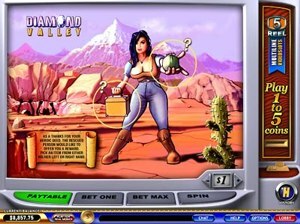 Diamond Valley is a $1 coin slot machine with 5 reels and 5 pay lines. The jackpot is only available if you play max coins or $5 each spin. Diamond Valley also features a bonus screen game. To hit the progressive jackpot you must hit 5 Diamond symbols on the 5th pay line. If you happen to hit the 5 diamonds on any of the other four pay lines you will win a minor jackpot of $5000. No wild symbol is added in this game however there is a "Scatter Pay" symbol. The bonus round also makes up for the lack of a wild symbol, giving you an additional way to win. The bonus round is activated by hitting three or more hand symbols aligned left to right on an activated pay line. This sounds like it is a difficult combo to hit but in our experience it does come up quite regularly. The actual bonus screen round is a multiple choice game where you first choose from 3 people and then select one of the items they are holding. Your prize is the revealed and you return back to the main slot game. "Hidden amongst desolate, snow-capped mountains, one thousand miles from human civilization, lies the land that time forgot - Diamond Valley. Eagles soar in the skies above and vultures encircle menacingly as you risk life and limb in search of the most elusive, the most captivating, magical gem of them all." One of the largest Diamond Valley progressive jackpot of $216,196.72 was hit by Carnival online casino player James H. from Santa Monica, California. The largest jackpot of $325,199 was won by Ralph R. at Club Dice Casino in March 2004. You can see his story and interviews with several other Diamond Valley winners here.